Advanced Networking Hardware. Included with your service for no additional charge. Awesome! The ONT (Optical Network Termination) is the “receiver” of the Internet signal over the fiber network. It converts light traveling over the fiber optic cable into data for your home network. The FairlawnGig ONT is the box that connects your house to FairlawnGig. The FairlawnGig ONT is included, at no charge, with installation of residential service plans. The City of Fairlawn covers the standard installation cost for residents who sign up for service. FairlawnGig business customers have a different ONT, customized to match the specific requirements of each business. A state of the art, four-stream Wi-Fi access point to extend your wireless network to every corner of your home. Uninterrupted power supply – your Internet and phone service will stay on during a power outage. A four port Gigabit Ethernet router with a modern firewall and other security features that allow you to manage your home network. Two telephone ports for optional phone service. For most homes, we recommend using all of the home networking capabilities that are built into the FairlawnGig ONT. 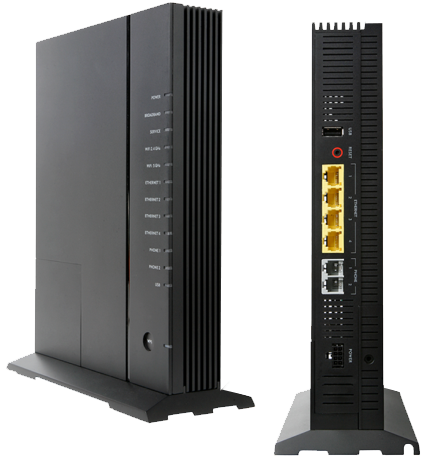 The Access Point, switch and gateway are integrated together and designed to work at full gigabit speed. FairlawnGig customers can manage all of these through an intuitive web interface. The home gateway and firewall allows you to manage your network security and includes parental controls that limit internet access to certain times of the day for the whole network or for particular devices. The Wi-Fi Access Point built into the GigaCenter is the most advanced Access Point available for consumers today. It is a Wave 2 802.11ac Access Point that supports simultaneous dual-band operation, 4 x 4 multi-user MIMO, four spatial streams, and beam forming. The technical jargon may be impressive, but what matters most for consumers is this single box will provide high speed Wi-Fi throughout your entire house. The GigaCenter is Wi-Fi certified and is compatible with all of your existing Wi-Fi devices. It supports all of the latest networking standards and is designed to work seamlessly with the newest Wi-Fi-enabled consumer gadgets such as Smart TVs, video streaming set top boxes, smart lighting, indoor home security systems such as nanny cameras, and the latest tablets and smartphones. Simply put: you want this Access Point. It is better than what you have now. It provides more coverage, faster speeds, and compatibility with a wider range of devices than any Access Point you are using in your home today. Every FairlawnGig ONT comes with the “FairlawnGig Guest” wireless network enabled. Two wireless network IDs are reserved for customers’ use. Your Access Point will be configured to support your home’s secure Wi-Fi network that you define. You could also set up an open Wi-Fi network for guests in your home, but it is not necessary with FairlawnGig. You could simply have your guests try “FairlawnGig Guest” when they need to access the Internet from your home. It is more secure. Your guests will have access to the Internet, but they won’t be able to see any of the network elements inside your home. You don’t have to give visitors your Wi-Fi password. And they can use FairlawnGig Guest at more and more places throughout Fairlawn as the wireless network expands. The FairlawnGig Guest network will not use up “your data” and will not reduce the maximum Internet access speed available at your home. If you have not yet signed up for FairlawnGig, then please call 330-668-3300, or fill out our sign-up form.